Tourism Minister, Hon. 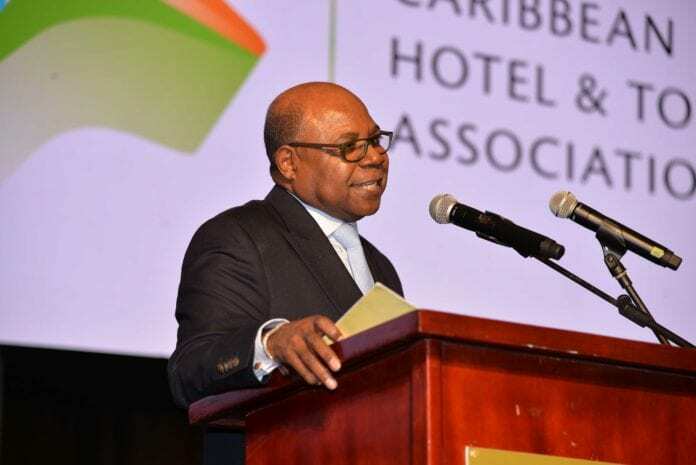 Edmund Bartlett delivers his welcome remarks at the opening ceremony of the Caribbean Travel Marketplace at the Montego Bay Convention Centre yesterday [January 29, 2019]. The Caribbean Travel Marketplace is the largest and most prominent tourism marketing event in the Caribbean. At the ceremony he said that tourism has to be sustained and this requires ongoing investment to improve existing products and develop new ones. Jamaica Tourism Minister, Hon. Edmund Bartlett, says tourism has to be sustained and this requires ongoing investment to improve existing products and develop new ones. The Minister made this statement yesterday, during the official opening of the 2019 Caribbean Travel Marketplace at the Montego Bay Convention Centre. “The future growth of the region is through tourism, the fastest growing industry in the world. But it is not good enough that 80 percent of world tourism comprises small enterprises who receive only 20 percent on return. Our financial institutions and our investors have a role to play in all this. They must see tourism as a viable investment and be more flexible in their loan portfolio for investment in the industry. Tourism has to be sustained and this requires ongoing investment to improve existing products and develop new ones,” said Minister Bartlett. He also shared that critical to these investments is human capital development, which his Ministry has placed as a major priority. “Investment in people is also a must. Our tourism workers must be trained to be professionals at what they do; whether they are Bell Hops, Scullions, Room Attendants or people in management. There is no room for mediocrity in 21st century tourism with a highly demanding clientele,” he said. Tourism Minister, Hon. Edmund Bartlett (centre), shares in conversation with the Secretary General of the Caribbean Tourism Organization, Hugh Riley and Organisation of American States’ Assistant Secretary General, Nestor Mendez. 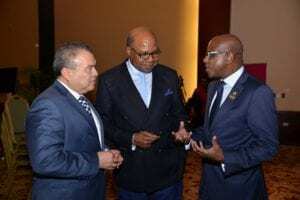 The occasion was the opening ceremony of Caribbean Travel Marketplace, held at the Montego Bay Convention Centre yesterday [January 29, 2019]. The Caribbean Travel Marketplace is the largest and most prominent tourism marketing event in the Caribbean At the opening, Minister Bartlett said that tourism has to be sustained and this requires ongoing investment to improve existing products and develop new ones. The Caribbean Travel Marketplace is the largest and most prominent tourism marketing event in the Caribbean. It is hosted this year by Jamaica’s Ministry of Tourism, the Caribbean Hotel and Tourism Association (CHTA) and Jamaica Hotel and Tourist Association (JHTA) and serves as an important platform to enhance exchanges between tourism suppliers from around the world. This year, for the 37th staging the theme is: “One Region. One goal,” and offers infinite business opportunities for 26 Caribbean islands and the 20 markets that are represented. “We are extremely pleased to have this opportunity, as host of Caribbean Travel Marketplace, to showcase the many wonderful natural, social, economic and cultural resources that Jamaica has to offer. “We must use opportunities such as that presented by Caribbean Travel Marketplace, to sell collectively to the rest of the world, the uniqueness of our mixed culture, the friendliness and welcoming spirit of our people, the delight of our Caribbean cuisine, the excitement of our attractions and, beyond question, the unmatched beauty of our respective islands,” said the Minister. Dignitaries and travel buyers attending this year’s Caribbean Travel Marketplace represent the nations of: Argentina, Brazil, Canada, Colombia, India, Mexico, Panama, Peru, Poland, Puerto Rico, St. Vincent and The Grenadines, Switzerland, the United Kingdom and the United States. In addition, for the first time in Caribbean Travel Marketplace history, the CHTA will also host a large contingent of Chinese travel buyers. In conjunction with the Global Tourism Summit in Hawaii theme, a general session focused on responding to a major disaster, Crisis Management: Dr. Peter Tarlow representing the International Coalition of Tourism Safety will be on the panel and offer the first step to become tourism safety certified. BEIJING, China - A woman reportedly downed a $200 bottle of cognac after airport security officials attempted to confiscate the liquor - only to be denied boarding as she was “too drunk to fly”.